Communicators of the New Patriotic Party, have for the second time running, been found to have used the most abusive language on radio in the second-leg of the political campaign language report compiled by the Media Foundation for West Africa. 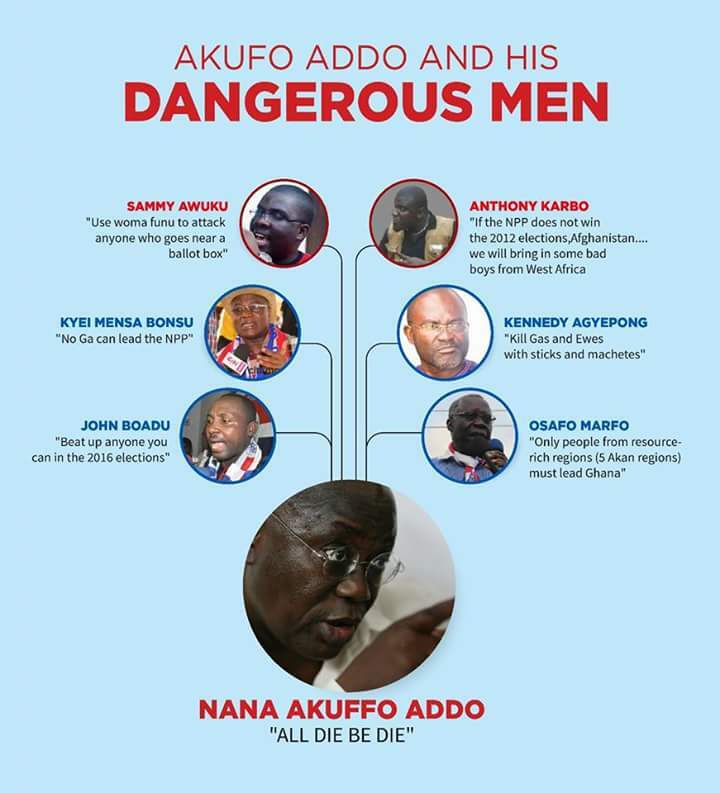 The report released today, Tuesday June 7, said “Officials, affiliates and supporters of the main opposition New Patriotic Party (NPP) topped the list of culprits with a total of 26 incidents. This was followed by the ruling National Democratic Congress (NDC) and the unregistered New Labour Party (NLP) with four (4) indecent expressions each. The others are: Progressive People’s Party (PPP) – two (2), the National Democratic Party (NDP) – one (1) and the Ghana Freedom Party (GFP) – one (1)”. Again, Accra-based Radio station Montie FM topped the pack of media houses where the most abusive comments were made. “Accra-based Montie FM recorded the highest number (16) of indecent expressions mainly on its Pampaso programme. Happy FM, also based in Accra, followed with 13 indecent expressions which were mostly recorded on its Democracy programme. Oman FM in Accra and Kumasi-based Ashh FM followed with 10 indecent expressions each”. The Media Foundation for West Africa (MFWA) has released the second report of its campaign language monitoring project. The report, which is based on monitoring of 923 programmes on 40 radio stations for the period May 1-15, 2016, names individuals and radio presenters who used abusive language, radio stations on which such indecent expressions were recorded; and political parties whose officials, affiliates and supporters used abusive language on radio. A total of 69 indecent expressions were recorded on 16 out of the 40 radio stations monitored. The report cites “Unsubstantiated allegations” as the most indecent expression used by individuals, political activists and radio stations hosts/presenters in political communications on radio. Accra-based Montie FM recorded the highest number (16) of indecent expressions mainly on its Pampaso programme. Happy FM, also based in Accra, followed with 13 indecent expressions which were mostly recorded on its Democracy programme. Oman FM in Accra and Kumasi-based Ashh FM followed with 10 indecent expressions each. Officials, affiliates and supporters of the main opposition New Patriotic Party (NPP) topped the list of culprits with a total of 26 incidents. This was followed by the ruling National Democratic Congress (NDC) and the unregistered New Labour Party (NLP) with four (4) indecent expressions each. The others are: Progressive People’s Party (PPP) – two (2), the National Democratic Party (NDP) – one (1) and the Ghana Freedom Party (GFP) – one (1). The monitoring report is the second of several to be issued by the MFWA before, during and after the 2016 elections (April – December). Under its “Issues Not Insults” campaign, the MFWA and its team of monitors are on a daily basis, monitoring and tracking indecent expressions used by politicians and activists on selected radio programmes. The campaign also involves monitoring and reporting how presenters/moderators on the selected stations handle their programmes and whether or not they allow their platforms to be used to abuse others. The project is being implemented with funding support from OSIWA and STAR-Ghana.